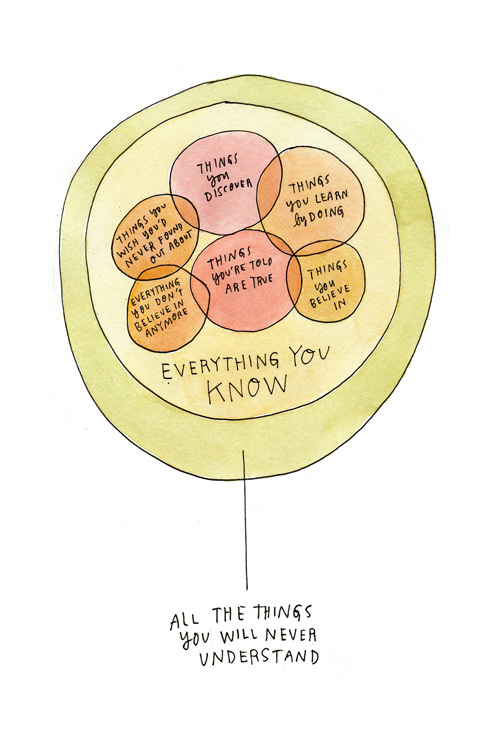 I first came across Wendy Macnaughton’s work through her venn diagrams, such as the one above. I was sucked in by both the humor and her minimalist, colorful style. Once I started paying attention I recognized her work in lots of places – funny how that works isn’t it? Macnaughton describes herself as a graphic journalist, a term that I’d never heard of before but it does make sense if you explore her work beyond the venn diagrams and other lettering work that she’s done. She tells the story of the people that she interacts with through her drawings, marrying these with snippets of conversations that she’s had with them and calling the result ‘Meanwhiles’. I was pleased to see that her earlier collection of ‘Meanwhiles’ from the San Francisco Public Library, one that I had unsuccessfully tried to get a hold of, was collected into her recent book ‘Meanwhile in San Francisco’. Well worth a look. Watch Wendy talk about her work and see her drawing in the videos below. Wendy MacNaughton: Listen to Strangers from 99U on Vimeo.